Art Tests allow you to gather anonymous (and therefore unfiltered) feedback about the artwork in your game. The Game Crafter community will be shown up to 10 images of the artwork from your game, and will be asked to rate it on prettiness and functionality. They'll also be given an opportunity to leave comments on each image. In the end, you'll have 100 opinions about your artwork. It can tell you what is good enough, and what needs more work. It costs 15,000 crafter points to get your artwork tested. For that cost you'll receive back a report with 100 opinions of your artwork. In addition, if you score at least 70 on the test, you'll receive an art test accolade for your game. How much does an art test cost? Can I use transparent images in the art test? All the images you use in the test should have full backgrounds. If you submit an image with transparent sections it will show the back background of the site. How do I submit my game to an art test? 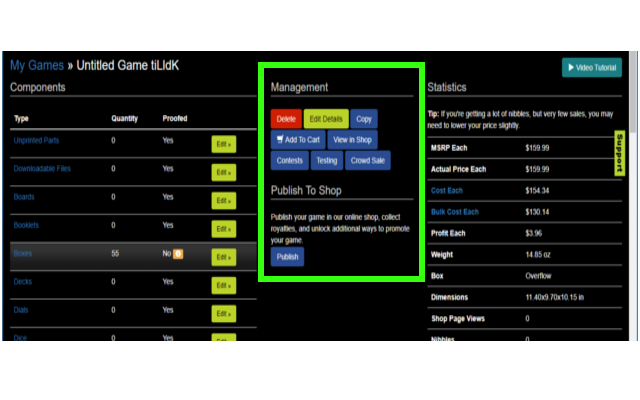 Edit your game in our game editor. Then click on the "Testing" button. There you'll be able to create an art test. What does a user see when they're voting? What does the report look like that I get at the end? Click here to view this report in full detail. What's pretty to one person isn't necessarily pretty to someone else. How does this test account for that? It doesn't. The point of the test is to figure out whether or not your art has mass appeal and whether or not it is functional. What does functional mean in this context? Functional means that the image serves its purpose well. Is it laid out nicely? Is it legible? That sort of thing. Can I get my game tested more than once? Yes. You can get it tested as many times as you like. How do you choose which 10 images are used? We select your shop backdrop, ad, and logo to start. Then we add up to 7 random images from the game. We try to select from as many component types as possible (mats, chits, cards, etc). If your game is all cards, however, then we'll be selecting just some random cards. We exclude things like booklets, documents, boxes, or score pads, that might either be not that interesting visually, or confusing to the voter.